The Sunday Times Estate Agents of the Year awards ceremony is known by some as the “Property Oscars”. It’s a glitzy annual event where magnates from top-named real estate firms in the UK go to claim accolades, suss out the competition, and maybe learn some new tricks of the trade. In attendance was Craig Ferguson. Ferguson isn’t new to the real estate game, but he is a fan of doing things differently. An estate agent for the last decade, in 2015 he struck out on his own to launch Deighton Mckenzie Estate Agents, an independent real estate agency serving the small East Midlands market town of Ashby de la Zouch, UK, population: 13,000. They won because they’re using Slack to turn the real estate process on its head. “The whole point of using Slack with home sellers is so that they can become part of the team,” says Ferguson. For the last ten years, Ferguson’s watched countless people struggle through the long, trying process of selling their homes—a situation already fraught with tension and often exacerbated by spotty communications (missed phone calls, lost documents, buried emails) between home sellers and their agents. 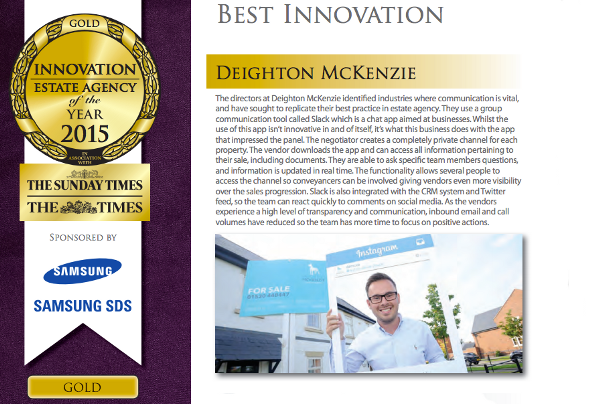 When he opened Deighton Mckenzie, he was adamant about providing better service through better communication. Ferguson and his associate Oliver Wright had already been using Slack to send messages and share documents while out of the office. They had an inkling they might be able to use Slack to keep in touch with home sellers more frequently throughout the sales process, so they started testing it with a few clients. To preserve their clients’ privacy, and keep conversations organized, they named channels according to each property (#1500-Madison, for example) and invited clients as single-channel guests. With combined access to all these channels, Ferguson and Wright could work better as a team to answer questions, offer instant updates about buyer interest, and generally be more responsive; something that comes in especially handy at the most critical juncture: the sale. It’s transparent, so clients have more visibility on sales progression and can get responses to their questions faster. Having an archive of messages means you have a full audit trail of the dates and times of every scheduled property viewing for future record. You can invite more than one home seller into a channel (a couple, for instance) so everyone can play an active part in the sales process, be more engaged, and make decisions faster. The ability to upload documents (like legal contracts and identification) into one easily accessible place. It decreases agent’s phone time, allowing them to be more attentive to their roster of clients and freeing up more time to pursue new business opportunities. Not to mention, they’re saving a lot of paper (a lot). Ferguson and Wright recently struck up an #ideas channel where they post photos of interesting properties they encounter on their commutes. Later, they’ll follow up with the property owner or developer about potential partnership opportunities. When broaching the topic of using Slack with prospective clients, Ferguson says most people aren’t put off by the idea of using “another app”, as long as it facilitates a less frustrating experience and a speedier sale. “We’ve got home sellers now who are selling their second house with us because they’ve been so impressed with the service,” says Ferguson. There you have it. A team in an age-old industry using modern means to deliver great service, the good old fashioned way. Lima Al-Azzeh really enjoys saying “Ashby de la Zouch”.